This, my latest publication for Ken Trotman, was originally published in the Oxfordshire Light Infantry Chronicle of 1905, but seems to have been forgotten ever since. There are already a few memoirs/journals of the 52nd Foot in print and one might wonder if Captain Ewart’s; which covers the period of 1811-12 only, can bring anything new. Every memoir I work on has its own unique character and never fails to bring something new to our knowledge or corrects misconceptions or inaccuracies from previous works. With regard to the other regimental memoirs; Colborne only joined the 52nd in Spain in December 1811 and missed most of the 1812 campaign, having returned home after being severely wounded at Ciudad Rodrigo. Kinloch was severely wounded at Badajoz and also went home to recuperate, therefore missing the remainder of the 1812 campaign. Captain John Dobbs was present throughout these campaigns but he paints with vivid broad brush strokes giving little specific detail. Therefore, although there are a number of memoirs of the 52nd Foot, Ewart’s daily journal, written up virtually at the end of each day for the two years he spent in Spain, is invaluable for the minutiae of the regiment and the brigade’s movements, trials and tribulations and proves to be a very useful source on these campaigns. John Frederick Ewart was born in 1786; the grandson of the Reverend John Ewart of Troqueer (1716-1799) and the son of Joseph Ewart (1759-1792) Envoy Extraordinary & Minister Plenipotentiary to the Court of Prussia, his mother being Countess Wartensleben. His uncles were all well connected as well, his Uncle John was Chief Inspector of Hospitals for the East India Company; Peter was a renowned engineer (1767-1842); and William was a Liverpool businessman, who was in partnership with Sir John Gladstone; the father of one William Ewart Gladstone, future Prime Minister. 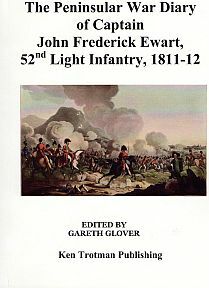 Ewart joined the 52nd Foot (Oxfordshire Light Infantry) on 1 November 1803 and undoubtedly through the influence of his family connections he very rapidly became a lieutenant without purchase on 10 March 1804; he then gained a captaincy in the 3rd Garrison Battalion without purchase on 17 April 1806. He exchanged back to the 52nd on 8 May 1807 and as such served at Copenhagen, the first campaign of the Peninsular war, being wounded at the Battle of Vimiera, and participated in the advance into Spain with Sir John Moore and the subsequent retreat to Corunna. He then served in the Walcheren campaign, before being sent with the 2nd Battalion 52nd to Spain in early 1811. He was present at the engagements of Sabugal, Battle of Fuentes d’Onoro, the storming of Ciudad Rodrigo and then transferred to the 1st Battalion, thus remaining in Spain and led the storm of Fort Picurina at Badajoz, when he was wounded in the arm and thus missing the final storm. He returned to the regiment, in time to be involved in the Battle of Salamanca and the subsequent advance to Madrid and later the costly retreat back to Portugal. At this moment, he learnt of his appointment as a major (again without purchase) in the Royal York Rangers and left the peninsula for ever.